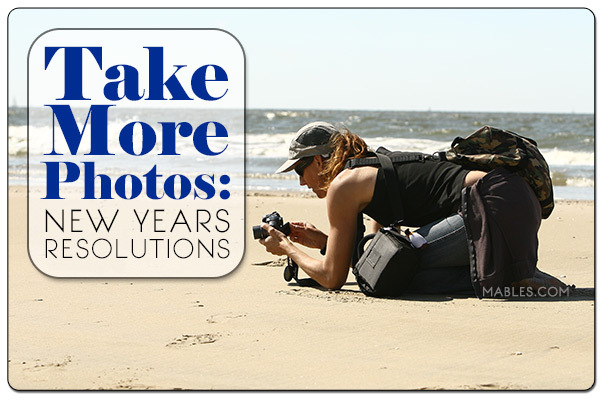 Continuing our series of New Year’s Resolutions from the previous Get In Shape article, Take More Pictures is next. Most people enjoy looking at pics on Facebook, Picasa (or other preferred photo viewing option) and reliving some great memories. As much as I enjoy doing this, I often wish I’d taken more pictures during trips, events, and especially everyday pics. Here are some reasons I didn’t take more pictures throughout the year and the possible solutions. Maybe you can relate? If you’re bummed about how your camera is too slow, too bulky, poor-quality pics, not enough features, low battery life, etc., then a camera upgrade is going to be a weight off your shoulders. How do you know which camera is for you? Common sense wisdom: evaluate what your needs are and choose the best camera for you. Read the specifications and other people’s reviews and pay attention to their details (e.g. Did it capture good in low light? Quick to boot up? Easy to navigate menu?) Also, start asking your friends about what they do and don’t like about their digital cameras. The Amazon carousel o’ magic below can also help you find the perrrfect camera. Not everyone is computer savvy and can manipulate digital photos into works of art, or simply print one out to frame. You can buy your own printer and photo paper and try it on your computer, or you can visit a web site, upload some pictures and have them delivered to you in many different forms. Some of my favorite ways to enjoy my digital photos are to have them printed out in different formats and displayed around the house to become a part of my everyday life. - ImageKind: They offer framed prints, canvas, posters, cards, laptop skins, water bottles, and other fun surfaces for your favorite photos. Okay, this one’s easy. You always remember to bring your phone with you, right? Make sure your phone has a good camera, so even if you forget to bring your primary camera with you, you have a reliable backup. Yes you are! You just don’t know it yet. I promise, the more you take pictures and flip through them with your favorite software the more you’ll become aware of what looks good and what doesn’t. Besides, the point of the photo is to capture a moment in time, not to see who can take the “best picture”. Believe me, getting an oddly cropped/slightly blurry photo is still better than getting no photo. But if you feel you need some training, you can take a FREE digital photography class online. How easy is that? For more choices and crazy-awesome digital camera deals be sure to check out eBay! Just last night I stood impatiently at the local Target Photo Center to get my digital photo prints and I asked myself “Why aren’t I at home in my comfortable pajamas doing this online? It’s probably cheaper too.” Guess what? It is cheaper, plus if this is your first time ordering, with the right timing, you can get your first 10-20 prints free. If you’re like us you accumulate some good pictures from your handy digital camera throughout the year. Well now half the work of sending out photos, or creating some quick and easy gifts is already done. With just a handful of pictures you can create a 2008 calendar (the recipient would have to remember your birthday), photo books (great for long distance relatives), mugs, stationary, mouse pads, puzzles, and more. You know, the classic customizable products. All this can be done in a few minutes, resulting in quality gifts getting shipped directly to your gift recipient and you never had to leave the house. Double Gift Score! SmugMug.com – More focused on photo sharing, and organizing, but has just as many options to print photos to gifts. This is a site for the photographer, amateur or pro, it’s a definite crowd pleaser. Wallhogs – These guys are for your bigger wall covering posters, canvas prints, and vinyl. I’m talking up to 7 feet long removable vinyl wall decorations from one of your awesome photos! That’s a gift!